Ballantine’s, the No.2 ultra-premium and Prestige Scotch whisky range in Asia-Pacific, has unveiled the 2013 Ballantine’s Championship Blend after exclusively bringing together Master Blender Sandy Hyslop and winner of the 2012 Ballantine’s Championship, Bernd Wiesberger, to create the sixth unique expression of the prestigious blend. The 2013 Championship Blend has been created with a selection of exceptional whiskies, aged for at least 41 years, and is being released to commemorate this year’s tournament which is taking place in Icheon, South Korea from 25 - 28 April 2013. Just ten individually numbered bottles of this rare limited edition will be produced, with one being gifted to Wiesberger as reigning Ballantine’s Championship winner and collaborator in the creation of this year’s blend. A bottle will also be reserved for the 2013 champion and another will be auctioned during the tournament for charitable causes. This exclusive and exceptional blend is presented in a prestigious bottle with a handcrafted and gold finished metal band which bears the individual bottle number alongside the signatures of its two creators, Sandy Hyslop and Bernd Wiesberger. The bottle also features Ballantine’s unique crest carefully etched onto the glass, enhancing the brand’s proud heritage and excellence. The bottle sits in a solid wooden cabinet with a premium leather cover featuring the iconic Ballantine’s ‘B’ and gold coloured metal band. 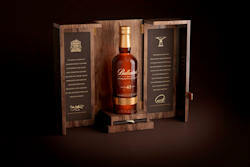 Interior leather panels on each of the cabinet doors, bearing a quote from Hyslop and Wiesberger, and a leather bound booklet complete the luxurious presentation of the 2013 Championship Blend, highlighting Ballantine’s association with golf and the uniqueness of the blend. 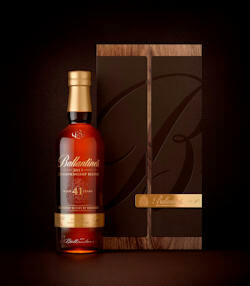 Since the inaugural event in 2008, Ballantine’s has established the unique tradition of creating an exclusive Championship Blend each year, created by Master Blender Sandy Hyslop with the reigning Championship winner. Wiesberger becomes only the fourth person in history outside of Ballantine’s expert blending team to be invited to work with a Master Blender in creating a Ballantine’s blend, with previous winners, Lee Westwood, Graeme McDowell MBE and Marcus Fraser having been granted the same privilege over the past five years. This year, Sandy Hyslop personally guided Wiesberger through a tasting of extremely rare and high quality grain and malt whiskies to assess which flavours he preferred before carefully blending the golfer’s selection. Ballantine’s association with golf can be traced back to 1960 when the first Ballantine’s Tournament took place at Wentworth Golf Course in the UK. Since Ballantine’s became the title sponsor of the Championship in 2008, many professional golfers have demonstrated their world-class talents at the Ballantine’s Championship and the event has fast become one of Asia’s most prestigious golfing events, with over 45,000 spectators in 2012 and coverage broadcast to 300 million homes worldwide.